Hi guys, as some people might be able to gather from my user name, I'm a bit of a dbz fan boy. I've been a big fan of C3Gs customs and I've been printing and playing for the last couple years now. I always thought about making an account on heroscapers but I never felt I had anything relative to give back in comparison to your creations.....until now ! As my arsenal of characters began to grow larger and larger, I decided to finally take a swing at making some of my own customs. C3G has superheros covered so I didn't want to try fixing something that is no where near broke. Instead I decided to design army cards in hopes that they can be compatible with C3G. 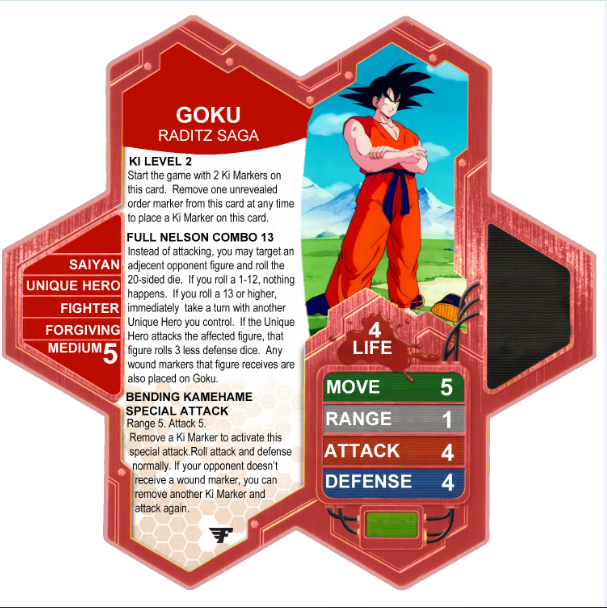 As of right now, I'm currently working on you'd never guess it, DBZ army cards. Yes yes yes, we can all make jokes, wont it take 4 rounds to fire off a move :P Come on, isn't it about time we finally settle those debates like who would win, Superman or Goku? I decided to go through the DBZ anime ( why not the manga? i like moving explosion c; ) and take down a list of notes on each character. I wrote notes based on performance of battle, characteristics, and other key elements of each character. A good question that came to mind was "how would I create an army card for say, someone like Raditz (a weaker bad guy) and have them be compatible for someone like idk, Brolly( Big steroid super bad guy)." 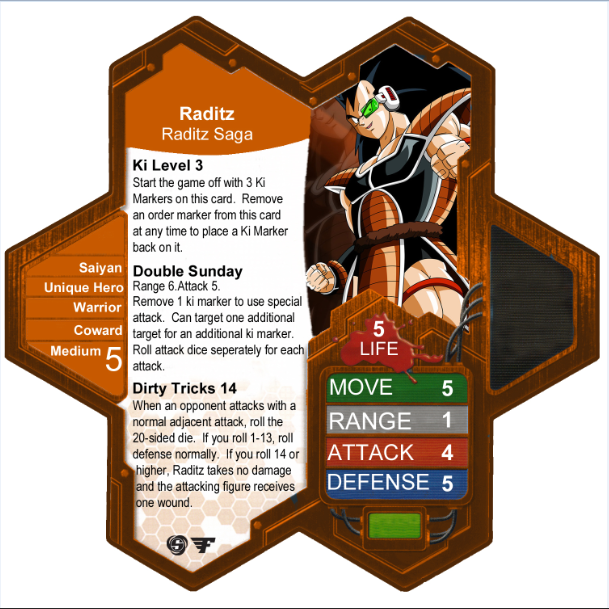 To eliminate the increase in each characters powers as they grew stronger and stronger in the series, I decided to make army cards for each character based on Sagas. That means depending on character performance, yes stats will increase or decrease, special abilities will replaced with new ones, and season 1 bad guys will be able to compete with season 3 and 4 bad guys. To make it short and simple, I started developing these army cards for use with my friends at home. I'm not a wizard with Photoshop so the cards a bit choppy;the text wording could use some work but tell me what you guys think. If anyone would like to use them, feel free to download them. I'm willing to go back and work on cards if they seem broken. Otherwise, I hope you guys have as much fun with them as I do! *may change special beam charge from 3 to 2. 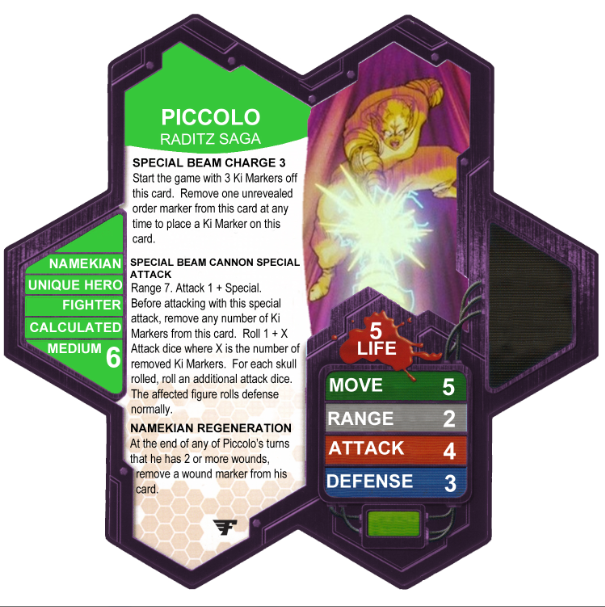 These miniatures are expensive my lord -_- and I thought heroclix were rough lol. You can find all different types of DBZ miniatures by looking up "Soul of the hyper figuration". It was the smallest sized dbz miniatures I could find. Some of the dbz figures are larger in scale then the heros, but its not a terrible size difference. Enjoy! Last edited by ImJustSaiyan; January 11th, 2014 at 02:26 AM. Re: Shenron Expansion into Superscape! Always cool to see a new face around these parts! Glad C3G inspired you to launch into some creativity of your own! 1. Use all caps in the left box, with the character name and secret identity, and with the power titles. 2. If a power is a special attack, the title should end with the words "special attack". 3. Always aim for clarity. What color are the Ki markers? 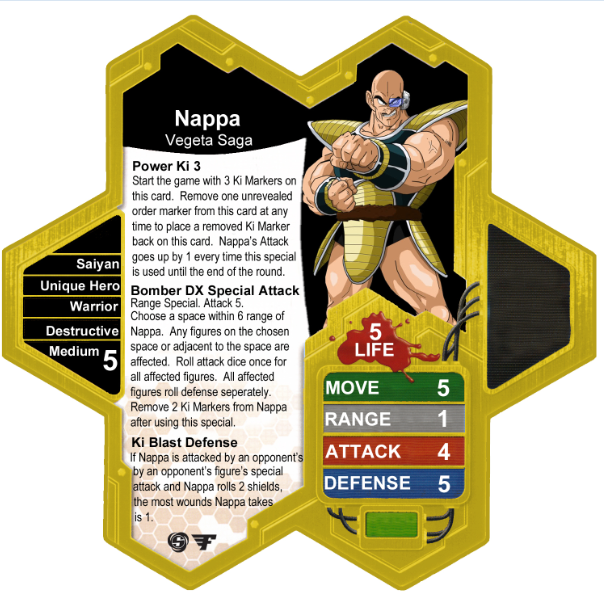 For Ki Level 3, do removed Order Markers have to be revealed or unrevealed? (This will change how the power plays). 4. You can use short hand, but don't use sentence fragments. In the special attack, if you don't want to spell out the title of the special attack, say "this special attack" rather than just "special attack." 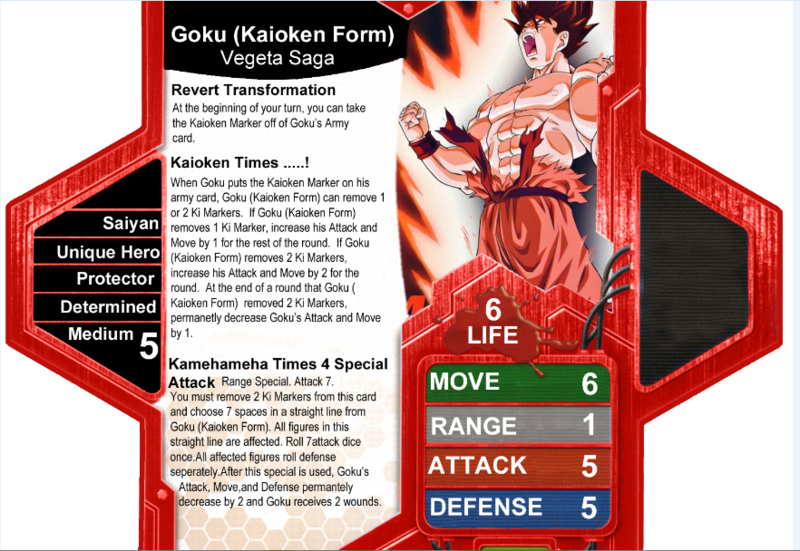 Before attacking with this special attack, you may remove any number of Ki markers from this card. Choose one figure to attack for each Ki Marker you removed this turn. Roll attack dice separately for each attack. Alright thanks for the heads up! 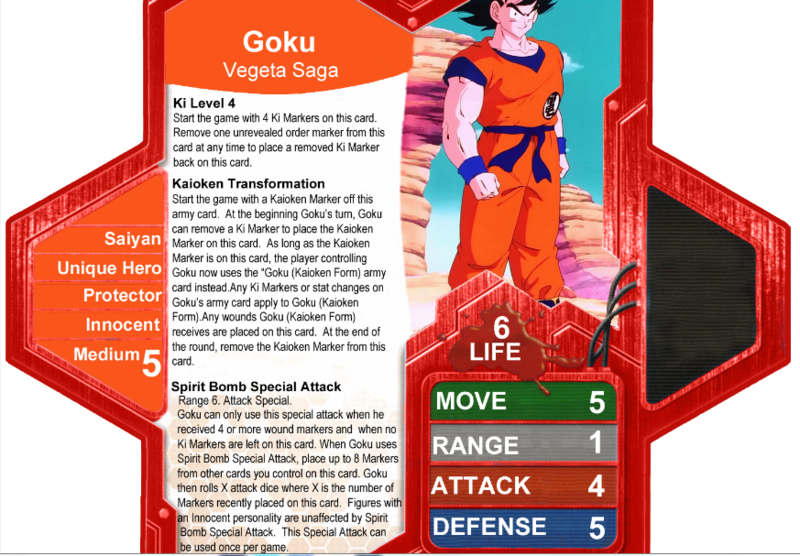 I think Raditz is the only card that I didnt properly state in Ki Level 3 that they have to remove unrevealed ordermarkers. I was originally going to make the player skip a move phase or an attack phase to get a marker back, but I felt removing an unrevealed order marker would replicate the charging period better. I plan on editing the four cards posted once i get Photoshop downloaded instead of using essentials. I downloaded the character creation book pdf I just haven't had a chance to scroll through it all just yet. Do you guys use helvetica on all the C3G cards? I honestly don't know what font we use! We've got a whole Art Department worrying about things like that these days. I ran into the same issue of power levels when I was thinking about DBZ units as well. Ultimately, the characters would end up being around the power level of Galactus by the end of the Kid Buu Saga if you wanted to scale them against C3G. For a good complete character list, I would recommend searching for a list of characters in the Budokai video game series, they were pretty complete and will keep you busy designing for quite some time. Do you have any of the figures you mentioned? I can't find information on their size, but I watched an unboxing video on Youtube and they look quite large. A picture to verify their scale would be helpful, though if they're expensive it'd probably be worth it to simply mod one's own from HeroClix minis. Some figures are bigger then others, I havent rebased them yet either. Right now I just have the stock bases on for play testing, but they are removable. Some people will mind the size im sure, i personally just like the art style. 8 figures that are black in white (still great sculpt) are around 25 - 40 bucks. Color'd ones you might as well buy a new car lol (not really, there like 60-80 tho :/). I was considering using budokai for character move sets, or using the new dbz game coming out Battle of the Z, bcus characters have classes in that game which give them different abilities, such as goku is a melee ofensive character where picollo is a beam unit, kid gohan is a healing unit ect. I decided i wanted to keep it more to the anime, so im not going to quite scale them progressively over the course of the series, im just going to slightly improve or subtract stats depending on how they did in combat throughout the series. Ill definetly consider the suggestion though! Wow for those prices I'll definitely stick to modding my figures That Vegeta one looks pretty awesome though, and is probably close enough to ignore scale issues. Nice find with those! And that is probably a good approach. I'll be keeping an eye on this thread for sure.